On the 31st of May Niki Sotirov has celebrated his 50th birthday. He was born on 1956 in Shumen. 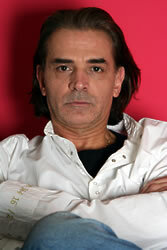 In 1980 he has graduated Krastyo Sarafov National Academy for Theatre and Film Arts. After that he had been playing in \\"Salza i smyah\\" theather and \\"Pantdans\\" formation for 9 years. At this time he had traveled abroad many times - USA, Venezuela, Peru, Equador, Columbia, South Korea, Japan. Niki Sotirov had played more than third characters in many Bulgarian movies. Recently he takes part in some American productions as: \\"Derailed\\" with the starring of Jean-Claude Van Damme, \\"Submerged\\" with Steven Seagal, \\"Icon\\" with Patrick Swayze, \\"Hammerhead: Shark Frenzy\\" with William Forsythe and Hunter Tylo, \\"The Mechanik\\" with Dolph Lundgren and many others.